Long before there was a fancy ballpark, crowd-pleasing promotions, and national championship trophies, Hurricane Baseball had a meager existence and struggled to attract attention to the scruffy ballpark at Ponce de Leon Boulevard and San Amaro Drive...but Ed Contreras was making a name for himself as Miami's first true big hitter. Playing for Major League Hall of Fame member Jimmie Foxx as a sophomore (freshmen were ineligible to play during Ed's era) he broke the then-school record with 8 home runs and tallied 20 runs batted in (RBI) in just 23 games, leading the team in both categories, and finishing just .001 away from the team leader in batting average with his .340 mark. The first baseman would lead the team in all three categories in 1958 for Coach Whitey Campbell, batting .316, hitting 7 home runs, and driving in 25, and led all teammates again in his senior campaign with a .310 average, 4 home runs and 22 RBI for Coach Jack Harding. 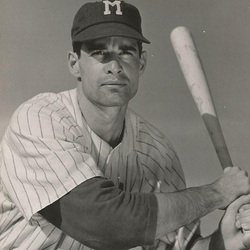 Contreras still holds the school record for slugging percentage for batters with less than 300 at-bats (.615) and his .696 slugging percentage in 1958 still ranks in the Top 10 for a season. He ended his career with a .321 batting average, with 19 home runs and 67 RBI in just 73 games played. Ed also lettered 3 seasons in basketball for Coach Bruce Hale. He graduated from Miami with a Bachelors in Business Administration in 1959 and was president and founder of Worldwide Technology, Inc., a company that holds a patent for his Water Ozonating System, technology that transforms water that is unfit for consumption into potable water. He is now retired and lives in Tampa. He has 2 daughters, Kimberly and Yvonne and enjoys spending time with them and his granddaughter, Leili Thomas.